I started this by juicing some apple from the yard. 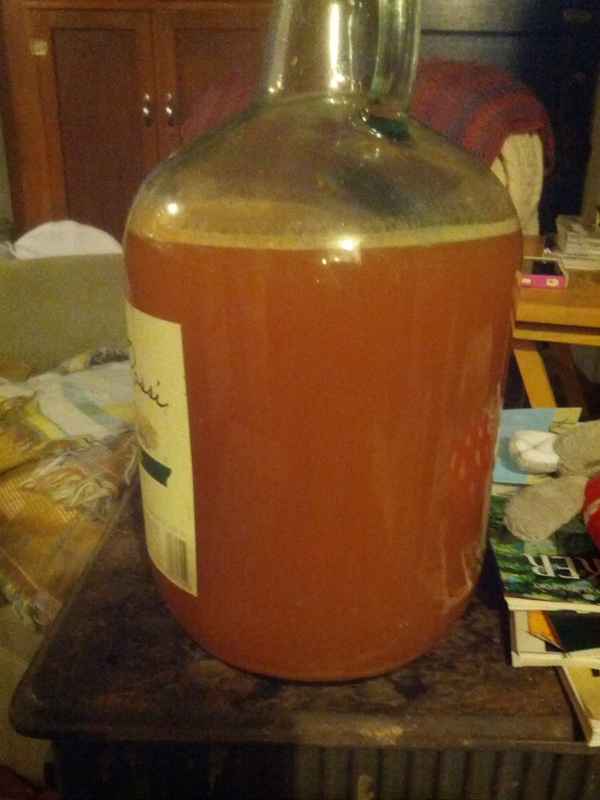 Put the juice in a clean carboy and let it do it's thing for a week. Then I decanted it off the yeast cake (it wasn't quite finished, but I don't want so much of the slow yeast for beer anyway). Anyway I over shot and got 1.7 and had to adjust using sodium bicarbonate. After that I hit 2.2. I put it in the fridge and I'm letting it sit there for ~two hours. I have some more boiled water chilling in there with some more baking soda in it. The plan then is to decant the yeast and dump the water in to bump the pH back up. It would be best to have some wort to pitch into. But I don't have that. If I'm up to it tonight I might make some wort with extract, but we'll see. So I decanted and added the water/sodium bicarbonate. It fizzed a bit, but I didn't loose much. I'd really like to check pH right now, but that's just another chance for contamination. I am making a few gal of simple wort tonight. I'm going to give it about 200ml tonight and put the rest in a carboy in the morning (no chill because I'm lazy). The hope is that it will show fermentation before I pitch, so I'm sure it's alive. If it's dead I'll use it as a starter for some expired white labs stuff I have kicking around. It's not going strong, but there are signs of life. I have no idea if this yeast will do anything good. The cider was fermenting far too hot and was getting a little bit of an ethyl acetate problem. But I have no idea what survived this crazy washing thing and what didn't. Only time will tell. oh I forgot the wort was at 1050 when pitching. I think 1040 would be better, but as long as it's not a huge beer it should be fine. Ok, I'll ask... Is that a condom? the whetstone is pretty random. They're just sterile balloons. They are commonly used as air locks by 17year olds making hooch. Do you think I cleaned my kitchen before doing this project? No, I did this project rather than cleaning the kitchen... my wife isn't too happy with me right now. You DON'T have one sitting on a kitchen counter?!? nope. mine it at my desk. Seeing CO2 production in the carboy. Something is alive in there, hoping it's good yeast and nothing nasty. You trolls didn't even notice the breast pump. my hands are breast pumps. You spend too much time with lactating goats. According to his bumper sticker .. "teats are teats "
Update: The "beer" is still really sweet but has a bad ester taste. Esters mean yeast, not infection. But the sweetness leans not much action? My conclusion too, I'm just going to let it go and see what happens. I don't need a 5 gal carboy for anything right now anyway, i've got bigger plans.